Dun & Bradstreet Hoovers needed to sell products and gain leads. Here's how UX helped. Alex is one of the best designers I have ever worked with. When she creates any design, she considers cognitive, perceptual, and physiological psychology factors as well as basic usability and user experience guidelines and realities. It was truly refreshing to work with her because she thinks about users and designs for them so thoroughly and from so many angles in an era when either coding or visual design are so often the only factors considered. Hoover's company fact sheets were online teasers of detailed business intelligence (BI) reports, bringing in sales revenue for the reports, and sales leads for BI subscriptions. Unfortunately, fact sheets were failing at their job. Here is a classic example of UX transforming cluttered, inconsistent design into a profitable feature. Solid AB test results offer yet another blow to the myth that success metrics must drop after any transformative change. The public D&B Hoovers site was a draw for the paid product, providing a high-level preview of the kind of BI data accessible to paying customers. 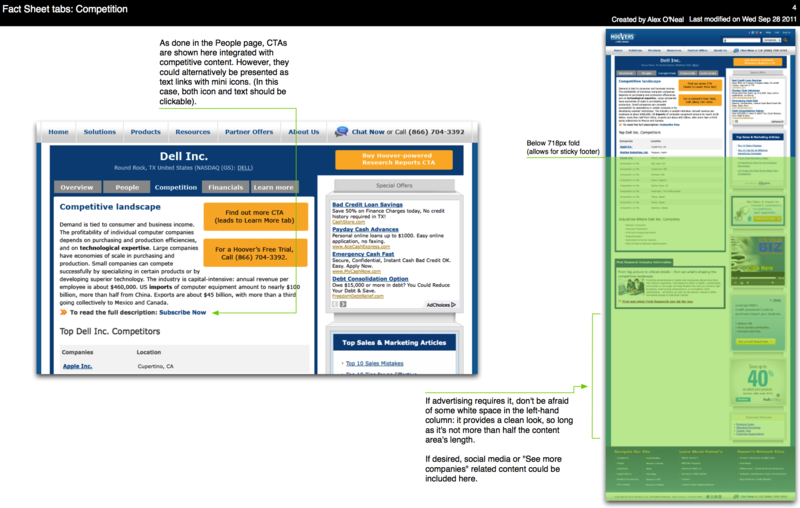 The free “fact sheet” view of companies not only contained business intelligence, but many calls to action and advertisements. More experience and basic usability issues are detailed in the image below. This is the first of six pages submitted as my IA/IxD solution to the product owner. Note that while heuristics are covered, the description's jargon is limited to concepts shared by UX and product. 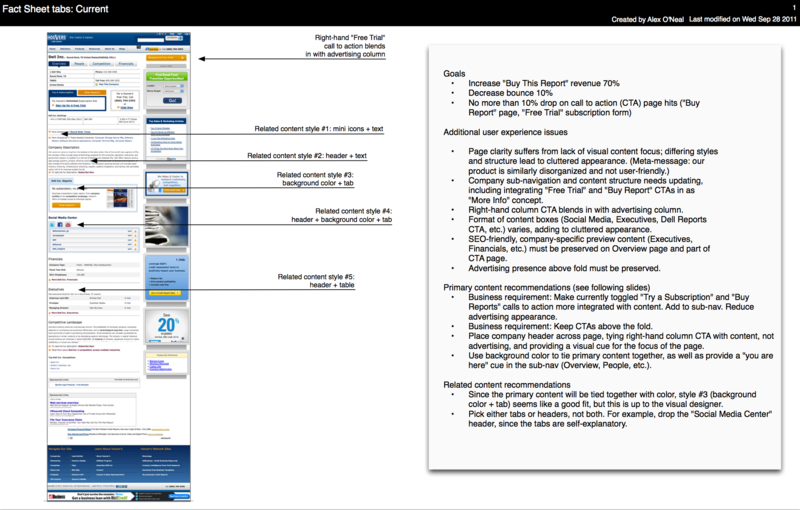 Goals and UX review, existing fact sheet page (page 1/6). Click on image to see it full-size, in a new tab. Visually integrated company data, setting it apart from global navigation, advertising, and related content and calls to action. Added an additional, business-required e-commerce call out. 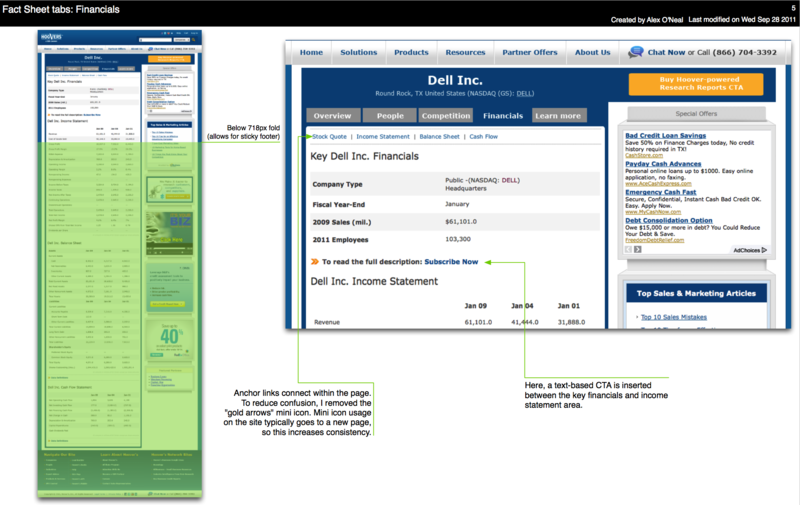 Visually grouped secondary (company) navigation buttons with content. Moved dual call-to-action area further down, as users couldn't make this decision without previously absorbing the content above it. Added a "Learn more" tab for more searchable company-specific content. 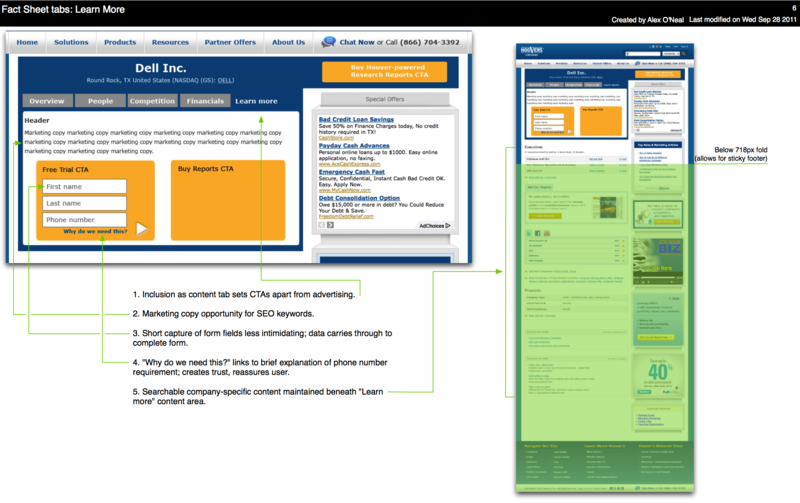 Recommended visually integrating ads with page design, to reduce ad blindness. At the same time, the main content had been clearly set apart from both ads and related content, to allow the user to focus on the heart of the page. 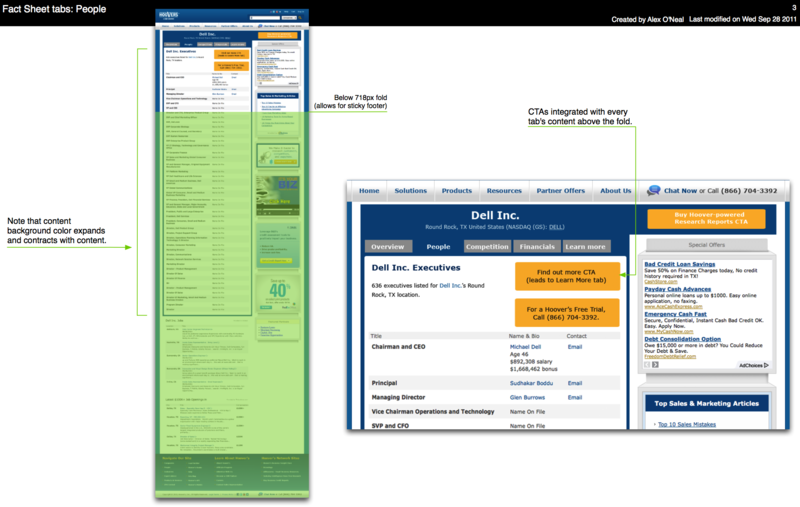 I do three kinds of wireframes: extremely stripped-down Balsamiq (or Visio, or Omnigraffle); high-res almost-comps (like the ones below); and "live wires," a.k.a. prototypes. It all depends on the situation. Since the fold line mattered for the vast majority of our users, each view shows where the fold line hits. 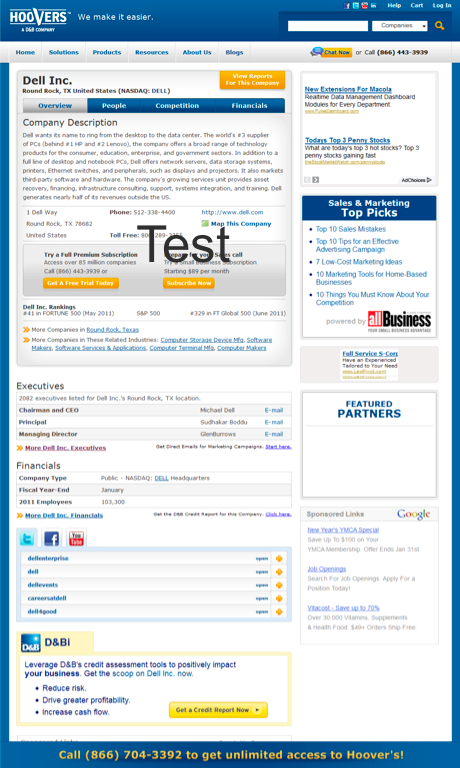 The company overview is right at the top of the content area, not hiding well below the fold. The tabbed CTAs are both visible at the same time. Initially I wanted the CTA above the advertising column moved to the main content area. Told this was not possible, I extended the background color to incorporate it and set it apart from ads. But as you will see below, this was not the final state. Click on image to see it full-size, in a new tab. The primary CTAs ("Find out more," "Hoover's Free Trial") are shown on nearly every tab. Previously they were only on the top level tab, and one was hidden behind a mini-tabbed interaction. 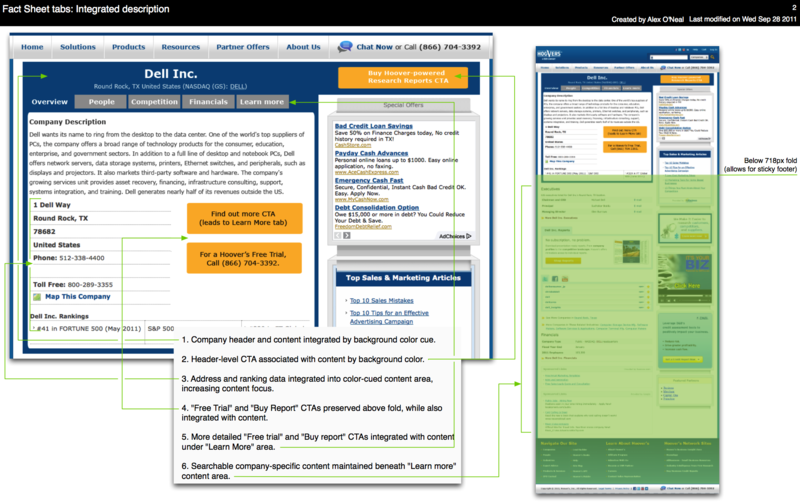 The background color follows the main content, keeping it defined from the rest of the page. "Mini icons" were the team term for inline icons, sadly still based in image files (I'm not even sure they used sprites). Design and development did not communicate as much at Hoover's as at other roles I've held. I take whatever opportunities I have to promote good design practices, such as being unafraid of white space. Anchor links lead customers to the financial data they want most. Because of the table format used here, I changed a CTA box into a text link with an inline icon. In addition to the increased CTA awareness on earlier tabs, a new tab was created to encourage report purchasing and subscription leads. A short form initiates a subscription lead. Inline help explains why we ask for an email. Should the user complete it, this data is preserved in a slightly longer form. Related company data still shows on this page. Immediate e-commerce revenue per visitor went up 84%. Bounce decreased 3%. This was not the 10% reduction desired, but revenue and lead increases offset it. Phone calls went down, but completion of online sales forms increased 33%, generating significantly more overall leads. Minimum phone calls were not an original requirement, but were incorporated into test analysis. Coding and time limitations prevented all recommendations from being implemented, but the heart of the changes were kept, and a key desired improvement was possible (moving the CTA above the advertising column into the main content area). Visual styling of the above wires was performed by the excellent Casey Decker (see below). Sorry for the "Test" text; I don't have a copy of the design without that. Click on image to see it full-size, in a new tab. I chose Dell as the example company because it was a frequent search by Hoover's users, and because it is such a strong presence in the Austin Silicon Hills. Who knew I would be working there a little over a year later?